Elizabeta Torres is a character in the GTA IV Era, appearing in Grand Theft Auto IV and The Lost and Damned. A 31-year old successful drug dealer in Bohan, she is introduced to Niko Bellic by Mallorie Bardas. Concept artwork of Elizabeta Torres. Notice her thinner and younger appearance. Elizabeta appears in the third trailer and in the promotional artwork for the game. 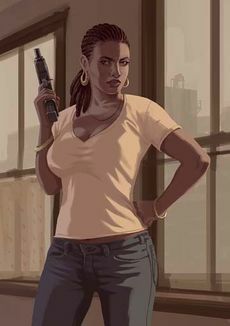 Although earlier renditions of the artwork depict her as much thinner than her final appearance, it is shown on advertisement posters made by Rockstar Games that she is between 5'11-6'2" tall and may weigh between 200-225 pounds. She has a slight island accent. At one point, she tells Klebitz that she was married three times. Elizabeta's appearances in Grand Theft Auto IV and The Lost and Damned do not chronologically match up. As the events of IV and TLAD are at the same time, Elizabeta is arrested directly after the mission Have a Heart, however, she is still available for the missions: Heavy Toll, Marta Full of Grace, and Shifting Weight, when she should already be in jail. This mistake is evidenced by the fact that Elizabeta should be in jail before the beginning of The Ballad of Gay Tony, however, it isn't until after I luv LC that Billy Grey is seen conspiring with the Triad in Chinese Takeout and is arrested. After this Johnny continues working for Liz until she's arrested three missions later. According to the storyline however, she would already be in prison. Elizabeta's unique pink and white Voodoo, obtainable only during the mission "Have a Heart"
This page was last modified on 26 October 2013, at 19:43.